Ethereum C++ cross-builds were birthed into the world on Saturday 28th November 2015. This is a really important milestone, because it opens the door to near-universal portability of Ethereum. The Light Client (LES) sub-protocol is still being refined. When we have working LES implementations the flood-gates will really open on the range of devices which can run Ethereum nodes. 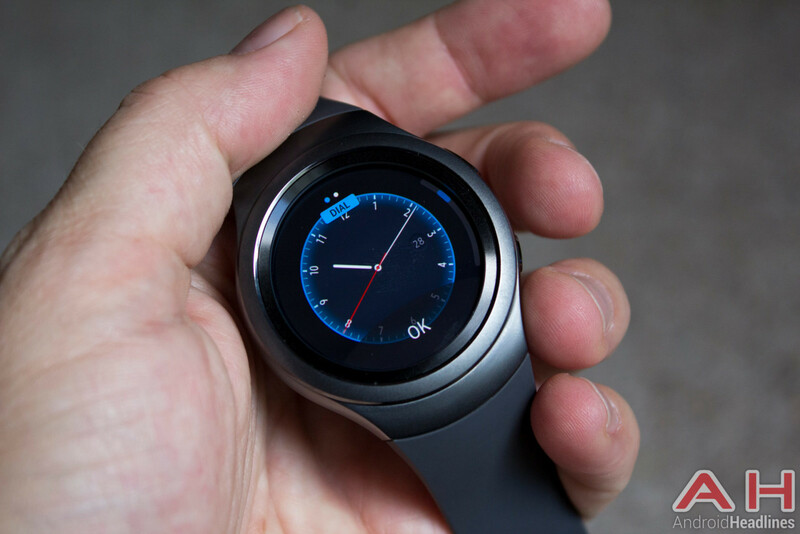 Getting to Light Client on mobile/wearable is the ultimate goal of all the work which doublethinkco is doing, with the Samsung Gear S2 smartwatch as the flagship target device. 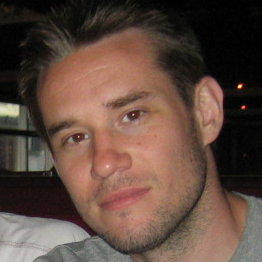 Zsolt Felfoldi gave a very interesting presentation on his Light Client progress at the recent devcon1 conference. The YouTube video of his presentation is unavailable at the moment, but will likely be available again in an edited form soon. To my knowledge there is no C++ implementation of LES underway yet. That was an intentional decision. No doubt the C++ implementation will get underway as soon as the details of the sub-protocol are settled, and the go implementation has been given a decent workout. Bob Summerwill and Anthony Cros have been working on Ethereum C++ cross builds since September, after the ETHDEV team came to the conclusion that the work-in-progress on Light Client needed to be rebooted as a sub-protocol, rather than as extensions to the existing ETH protocol. That change of plan left us with no real way to contribute directly to Light Client development. We needed to get ourselves out of the way while that design work was brewing and to do something else which was useful and would help the ultimate end-goal. So we took a detour, and focused on porting the existing C++ client code to as many mobile and wearable devices as we could, with a primary focus on Linux over Android and iOS. Having the existing full client available in as many places as possible means that we can just “turn on” Light Client on numerous devices as-and-when the C++ implementation of the new sub-protocol is available. Perhaps we can even help with that Light Client work directly ourselves? That was our original intention, but we were just too early for that to be practical. Maybe it makes sense now? Our detour has gone very much as we expected. That earlier article also talks about what cross-builds are and why they are important. We realized quite early that our needs were massively aligned with John Gerryts (EthEmbedded), who needed to cross-builds for the final phase of his Devgrant for embedded devices. So we’ve been working closely together most of the time, and especially in the last week or so, as we have had binaries to share. Martin Brook has just joined the party too. He’s one of the main Sailfish OS porters, and his input and testing has been very useful. So why is the C++ client so important? 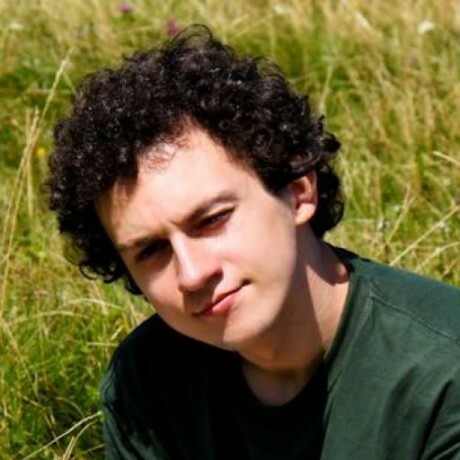 We’ve been working with both the go and C++ development teams, but because of Péter Szilágyi‘s excellent work with xgo, there has been close to no need for us to do any work there. Why not just leave things to the go team? It’s because C/C++ is the foundation of all systems programming and performance critical applications, and it has been that way since the very first UNIX releases, and will likely be that way for many years to come. C/C++ is always the first language on any new platform so code written in C/C++ has universal reach, all the way down to the very smallest of devices. We are finally starting to get some innovation and competition in the systems programming space with go and rust, but it is exceedingly unlikely that those languages will ever make a significant dent in the wearable, embedded and IoT space. With the renaissance of Modern C++, it is possible to write C++ which is maintainable and understandable as long as you are disciplined and stick to best practices. It isn’t easy, and elements of C++ like the pre-processor, compilation model, lack of cross-platform build system and lack of cross-platform packaging system make C++ “not fun” to work with. Bob has been doing it for nearly 20 years though. Not a problem. Doesn’t Moore’s Law mean that this kind of “close to the metal” performance doesn’t matter anymore? Nope, because we’re running into Amdahl’s Law, which essentially states that the potential speedups for a given application are ultimately limited by the work which can only happen in a serial manner. Having 16 or 32 cores doesn’t help if your application isn’t of a type which can benefit from massive parallelism. In addition, raw performance is going to be critical for the resource-constrained devices which are going to be spawning in their billions in the next few years with the growth of IoT and smart devices. Why the focus on mobile Linux, not Android? Isn’t Android an open source platform, and shouldn’t that be the primary focus? Android is really not as open as Google would like you to think (excellent article on that a few years back), and Google are obviously a nefarious data-farming corporation in general. Replicant are trying to “free” Android, but it’s a losing battle. All mobile devices have serious privacy and security issues. Everybody already knows about Apple’s control-freak nature. Ethereum may or may not ever be allowed into the App Store. They have got form. Don’t be surprised if they ban iOS and watchOS applications which use Ethereum. It is a mortal threat to their monopolistic control of all commerce and applications on THEIR platform. We’ll port to iOS and watchOS, but it might never be shippable. Dockerfiles which let you cross-build ARM binaries which are already known to be working on Raspberry Pi 2, Raspberry Pi Zero, Odroid XU3 and Wandboard Quad. We are working towards working binaries for a very significant range of devices. doublethinkco/cpp-ethereum-cross repo on Github, which includes the full test matrix in the README. Working through the large test matrix. … then Bob will get automated builds and automated testing running on the mobile/wearable home test farm he has been building. Following the go team’s lead, we are likely to start publishing cross-build binaries too, as soon as they are in a stable enough state for that to be worthwhile. It would be very useful to have matching cross-build binaries for the forthcoming eth-1.2.0 release, for example. If you have further mobile/wearable/embedded devices which you think need some Ethereum love, please tweet us and we’ll see what we can do! Check out our webthree-umbrella-cross Github repo. Yesterday I spent some time improving that front-page so that the project is close to self-describing. We’re getting very close to having working binaries, and are attacking multiple platforms in parallel. We have (currently broken) releases which anybody is welcome to use to help to with our debugging efforts. We’re working with EthEmbedded to get this cross-build infrastructure working for single-board-computers as well as for our mobile/wearable target devices. Join us in the Gitter porting channel if you would like to help out, or just follow along. Our new-and-improved DOT dependency graph is in a Pull Request for merge back to the main ethereum/webthree-umbrella repo. Jolla Phone has arrived at doublethinkco! I know I’m a bit late to the party, and that it is November 2015, not November 2013, but my Jolla Phone has arrived in Vancouver! I had to order the phone indirectly, for delivery to my parent’s house in the UK, and then re-mailed from there. I have heard some whispers of 3G working for people in Canada, and will report back on whether I can get that going with my Rogers provider, or if I’m tied to 2G. The company could use some good news, and I hope my purchase and continuing intention to bring Ethereum to Sailfish will raise a faint smile on some weary faces. A familiar name popped up to help with that process yesterday, with the arrival of Martin Brook (vgrade) who is trying a Sailfish native C++ build in parallel with our ongoing C++ cross-build efforts. Great to have him helping! Ironically, getting the Sailfish cross-build working on the Jolla Phone is likely my quickest route to a Tizen Gear S2 version. Because the whole platform is built for developers, not for dumb consumers! 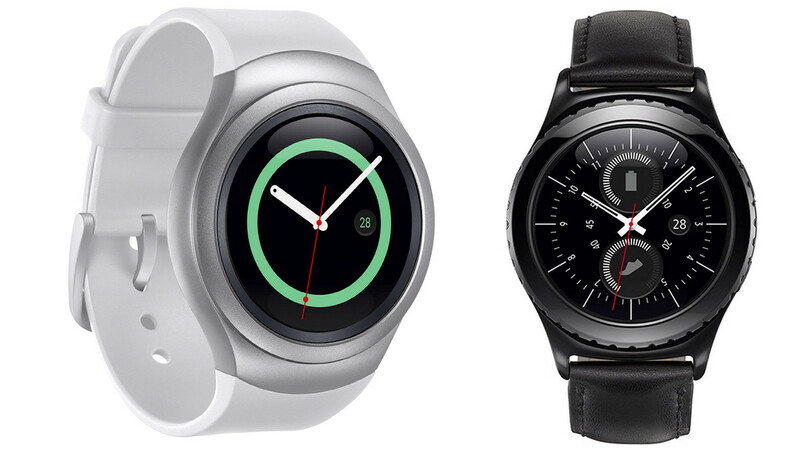 No GDB on the Gear S2, for example. Best wishes, Jolla and sailors! Laura Kalbag from Ind.ie did me a huge favor recently when she pointed me to the superb DeviceLab from Vanamco. As a background task I have been putting together a home-based mobile Linux test farm, which I will be using for automated testing of our Ethereum ports. And all of this is going to sit behind the pfSense box I built, when I finish the OS setup and cabling on that. I might revisit my wireless router setup at the same time. So what have I got racked up on those two boards right now? Developer phone Nexus 4 Sailfish 1.?? And what else do I have which isn’t hooked up yet? Smartphone Meizu MX4 Ubuntu Edition Ubuntu Touch ??.?? Tablet Nexus 7 Android ? Tablet Samsung Tab S Android ? Tablet iPad 3 iOS ? SBC Raspberry Pi Raspbian ? And completely unrelated to this effort, I also have my Commodore 64 and Atari VCS to get connected! 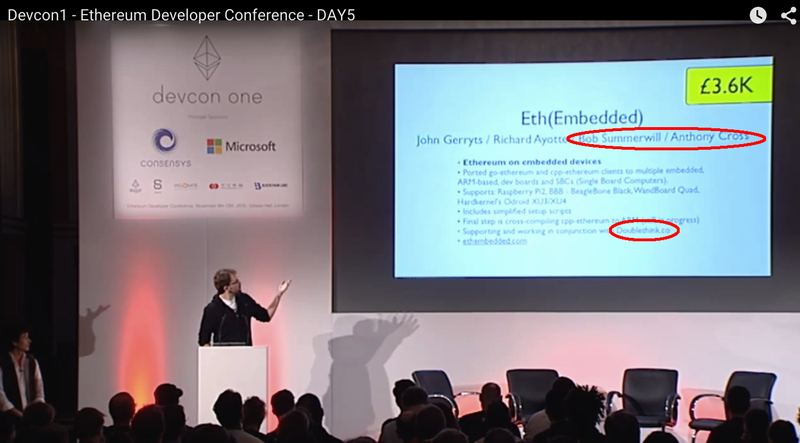 Many thanks to John Gerryts for crediting Anthony and myself as contributing to EthEmbedded project, as shown on the “DEVgrants Update” slides at the Ethereum devcon1 conference today. NOTE: You can follow along with our day-to-day progress on the Ethereum Porting Gitter channel. Some progress! 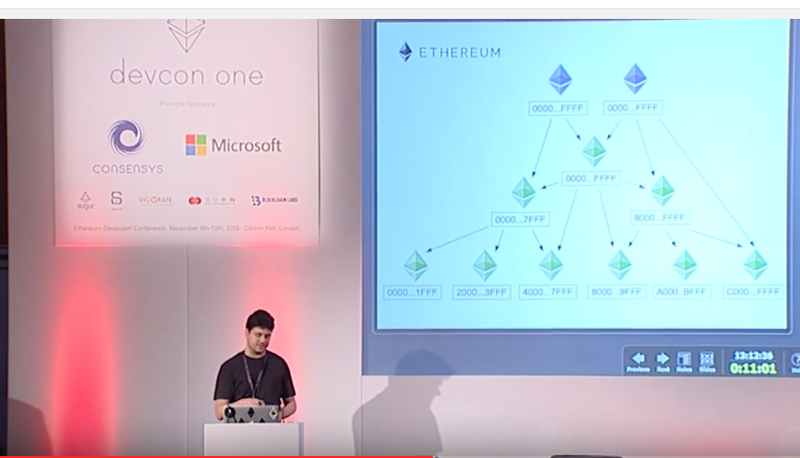 On both fronts: go-ethereum and cpp-ethereum. Our efforts lately have been focused on cross-compiling these two projects targeting an ARM architecture. The easier one first. As Bob mentioned in his latest post, Péter Szilágyi from the go-ethereum team has created the great xgo tool, that allows cross-compiling go-ethereum to different platforms (though it is not limited to cross-compilation for Ethereum, it is a general tool). Using xgo and the instructions from its README file, I was able to generate a binary for geth quite easily and without any change (xgo notably leverages the power of Docker). I was then able to run this binary on a Samsung TM1 developer phone (with Tizen O.S. ), a process I will detail in an upcoming post. The binary worked well up until a point during block synchronization (~block 90K) where it failed, though nothing indicated it was an issue with the platform itself (more likely the particular version of geth I had used for compilation). I will rebuild and report on the result soon! 1 file(s) pushed. 0 file(s) skipped. INTRICACIES OF CRYPTOGRAPHIC TOKENS AND BLOCKCHAIN-BASED OPEN SOURCE SOFTWARE, ETH PLATFORM AND ETH. TYPES OF DAMAGES. THEREFORE, SOME OF THE ABOVE LIMITATIONS IN THIS SECTION MAY NOT APPLY TO A USER. INJURY ARISING FROM ANY WILLFUL MISCONDUCT OR FRAUD OF STIFTUNG ETHEREUM. Much more manual work here, but after much struggle I was able to successfully cross-compile the libweb3core library. I created a set of scripts that should allow anyone to reproduce this process (in fact please do and report on any issue encountered!). code – Commenting out the CXXFLAGS-march=native flags from CryptoPP‘s Makefile. Likewise I found no cleaner way to unset this flag (which you must for it to succeed). I ended up having to create a ~/$HOME/cryptopp symlink to CryptoPP’s installation directory for libweb3core‘s CMake file to be able to detect CryptoPP’s headers, no other combinations ever seemed to work. This on top of making CMAKE_INCLUDE_PATH point to the source directory. Removing either results in a failure to detect said headers (note that no such issue occured for the detection of the library itself). code – Disabling of MiniUPNP, which has apparently broken backward compatibility in its latest version and for which I wasn’t able to find a working version (typically because of failure to include upnp-dev.h, which would have also required hacking their CMake file). code – Removal of erroneous -lOFF artifacts from the CMake configuration phase of libweb3core, a bug I have brought to the attention of the cpp-ethereum team. If anyone is aware of workarounds for these or can even suggest a more straighforward/correct way of getting to the same result, please contact me on gitter. So overall it’s quite a lot of pieces that need to work together in order to create such a binary. Next step will be building other necessary components for eth to run. After which I will hopefully be able to test the C++ client on the same Z3 phone!